As a historian of the left it’s always intriguing to come across campaigns that you have never come across before. In this case my interest was sparked by a reference in Black Dwarf to a Sister Patricia Veal speaking at an Equal Pay Rally in London in September 1969. I had never heard of her so I followed up this mention and discovered that she had been leading a campaign for nurses for about a year. I have now found some additional information in the press and thought it would be useful to put this into this post in the hope that it may lead to more information about Patricia and the campaign coming to light. Sister Patricia Veal worked as an administrative sister at South Western Hospital in Stockwell, London. In July 1968 she had read about nurses lobbying MPs over pay, went along to the House of Commons but found no other nurse there. So hhe decided to organise a march herself and spent £6 on sending letters to every hospital in the country. Her efforts paid off. On 15 August 1968 Patricia led a march of 1,000 or so nurses from Marble Arch to 10 Downing Street where they delivered a letter to the Prime Minister Harold Wilson. They include nurses from nine London teaching hospitals as well hospitals in Sussex, Surrey and Derbyshire. Some hospitals had tried to stop nurses attending by refusing them time off. In some cases nurses had been forbidden to wear their uniforms, but many marched in the uniforms they used for private cases. Some marched barefoot: one nurse from India marched in her sari. The nurses marched six a breast down Park Lane under the slogan “Unite and Fight” and carried banners that said, “There’s a curse on the purse of every nurse” and “Wait till you get a hernia – Mr Wilson”. They sang songs about bedpans and bad food to the time of “John Brown’s Body”. Passers-by often applauded as they passed. In Whitehall the march paused while Patricia fixed her hair. 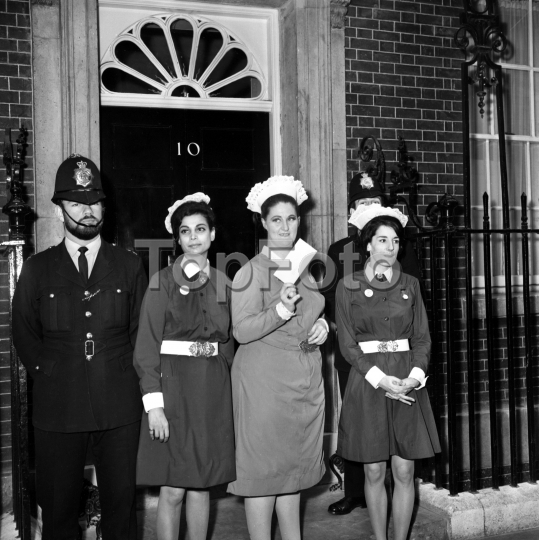 Finally, on arrival at Downing Street, the letter was delivered by Patricia, along with two colleagues from the same hospital, Sister Tina Stone and Sister Mary Chundee. The letter said: “We are dissatisfied not only because of the latest salary increase which was comsumed by the latest increases in board and lodging , National Health contributions, income tax, and superannuation but we are equally concerned over working conditions resulting in the loss of so many nurses. We believe that the National Health Service is wasting money and that many departmnest need rorganising and streamlining.” They called for an immediate increase in the nursing establishment in all hospitals and higher pay. After the march Patricia said, “Now, there’s going to be no turning back. We’re going to form an association to keep this up!” She and a number of other nurses held a meeting in one of their flats on 22 August and set up the United Nurses’ Association. They told the press that they had received many letter, both from nurses and the mothers of student nurses who complained about the treatment of their daughters by hospitals and the nursing hierarchy. Many of the mothers explained that they had been silent previously because of fear of repercussions. The UNA decided to follow-up the march with a “Unite and Fight campaign,” contacting hospitals with literature. Sister Jean Baxter, Secretary of the UNA, said that she had been appalled to hear and see grossly understaffed wards, a situation which led to overworked student nurses leaving before they had finished their training. There were also situations where unqualified auxiliary nurses were left alone at night in charge of wards. Above all, she said, nurses must unite to prevent the vicious circle which caused chronic staff shortages. The UNA’s grievances included plans to make nurses “pay to eat,” the working conditions of nurses – especially student nurses – who were often ordered to carry out cleaning duties, overwork, poor pay and and the way that pay was negotiated. Their demands included £11 a week for student nurses with free meals and travel warrants. How many nurses actually joined the UNA remains a matter of speculation, but it seems to have attracted particular support from student nurses. Other nursing organisations such as the Royal College of Nurses, dominated by qualified nurses, were far from enthusiastic about the actions of the younger women, particularly when the UNA called for matrons to be sacked. The nurses also somewhat half-heartedly tried to emulate the suffragettes by tying themselves together with bits of string. The Serjeant-at-Arms, Rear Admiral A H C Gordon-Lennox, took them into custody and they were detained “at the Speaker’s pleasure” in a small, cold room. They were eventually let out at 1.30 pm on condition they did not cause a disturbance within a mile of Westminster. Patricia told the press that the MPs had been talking “a load of drivel about Shetland ponies” so when she had spoken “all the MPs woke up”. Christine Doyle interviewed Patricia for The Observer in April 1969, visiting her in her small flat above a jewellers in Tooting Bec. Patricia was 34. She was from Cornwall with an Irish grandmother and agreed that she was “a dangerous Celt.” “But I like cosmetics and beauty culture, I like perfume especially. I’ve got Tigress by Faberge. Quite appropriate”. Since her campaign had hotted up she admitted that she was living mainly on scrambled eggs and toast. Patricia named her outside interests as “Men. Church activities”. The UNA staged another protest on 22 April 1969 outside the Department of Health and Social Security with 150 nurses singing “Why Are We Waiting.” Patrica told the press, “We want this system abolished. These girls are hungry.” After five minutes the Secretary of State himself , Richard Crossman, came out to speak to them. He said that nurses had their own representatives who were negotiating on their behalf.He suggested that rather than stand in the cold wind, they send in a delegation. This was done, with a small delegation going in to speak to Lady Serota, a Minister, for an hour. Patricia told the Minister that some student nurses were struggling to eat. Most of the nurses present were from London, Surry and Kent, but they were joined by a coachload of 50 from South Wales who had set out at 6am. In July 1969 Patricia issued a writ for libel against the Sunday Mirror for an article published on 1 June entitled “Me and my clients – by Sister Veal”. On 27 August 1969 the UNA supported a demonstration by striking ambulancemen at County Hall, London. In March 1970 the UNA urged nurses to leave the NHS and work instead for nursing agencies. This call came shortly after a fifth round of talks on nurses pay between the Whitley Council and nurses’ represenatatives broke up with no agreement. The chair of the Whitley Council, Mr W R Griffiths, said that there had been “fundamental” disagreements on grading. The lack of agreement meant that nurses would not get their promised 20% pay increase on 1 April. After this date I have not been able to find any other references to Patricia Veal or the United Nurses’ Association. This was not the first public protest by nurses. 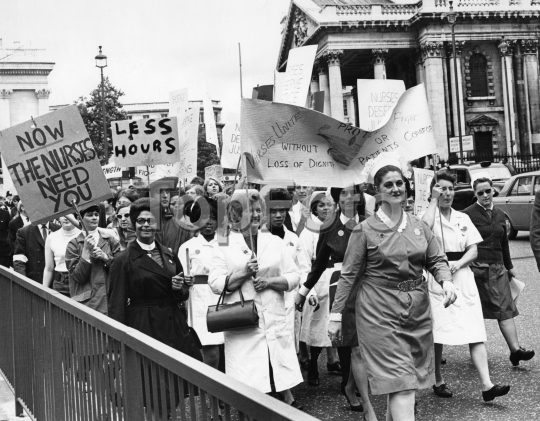 In April 1962 10,000 nurses, (about 50:50 male and female) protested over pay in Trafalgar Square, for instance. However the actions of the UNA was the first organised protest by nurses over the conditions of work of nurses and they were treated by those in authority above them . The profession was highly hierarchical and often very conservative with managers feeling entitled to pry into nurses’ private lives, for instance. In this sense the UNA was akin to many of the protests taking place across Europe and in the USA in the course of 1968. Whilst they had different targets – the war in Vietnam, race, male authority, etc – they were united by a rejection of power, hierarchy and tradition and a desire to explore alternative structures and experimnet with different ways of living. The UNA also used the tactics of their contemporaries which were designed to attract publicity. Although it was shortlived , the UNA was regualrly in the headlines, and Patrica Veal was frequently quoted by the press, much to the anger I suspect of the traditional nursing organisations. It pointed the way to the future. In the 1970s and 1980s nurses became increasingly militant, joining protests in increasing numbers and even went on strike.